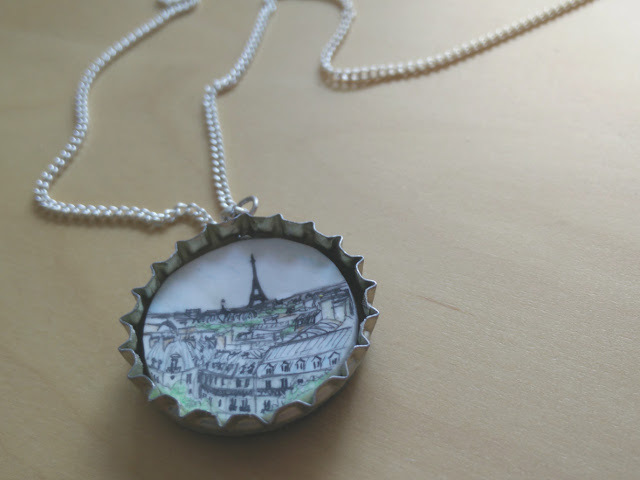 This is an idea of how to make shrink plastic jewellery with recycled bottle tops. 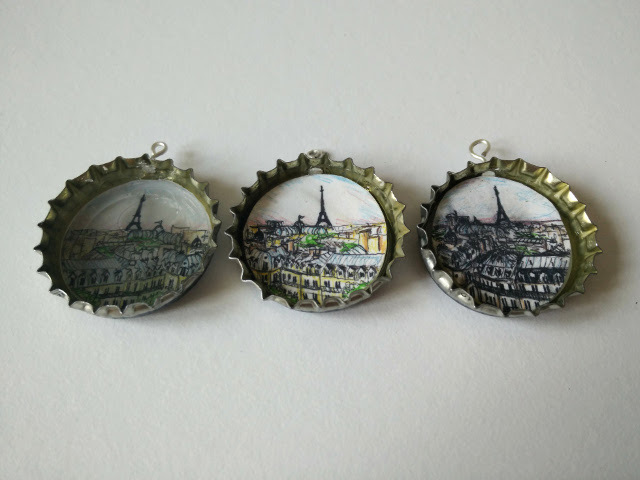 You can use this method to turn metal bottle tops into beautiful necklaces, earrings, brooches and more. 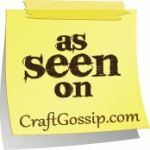 Have you used Shrink plastic before? It is a special sheet of plastic that you can draw on, at a normal scale, but when you cook it in the oven, it shrinks to about half its size. These durable, miniature plastic creations can be used for all sorts of creative projects and jewellery. 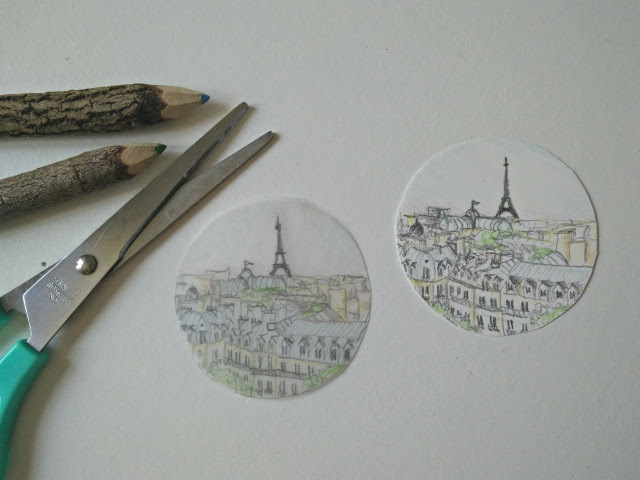 The jewellery is made by making a circular pattern on a piece of shrink plastic that will shrink to the exact right size to fit inside a bottle top. You could use this technique to make all kinds of jewellery. Use any design or colours to create jewellery in your own style! 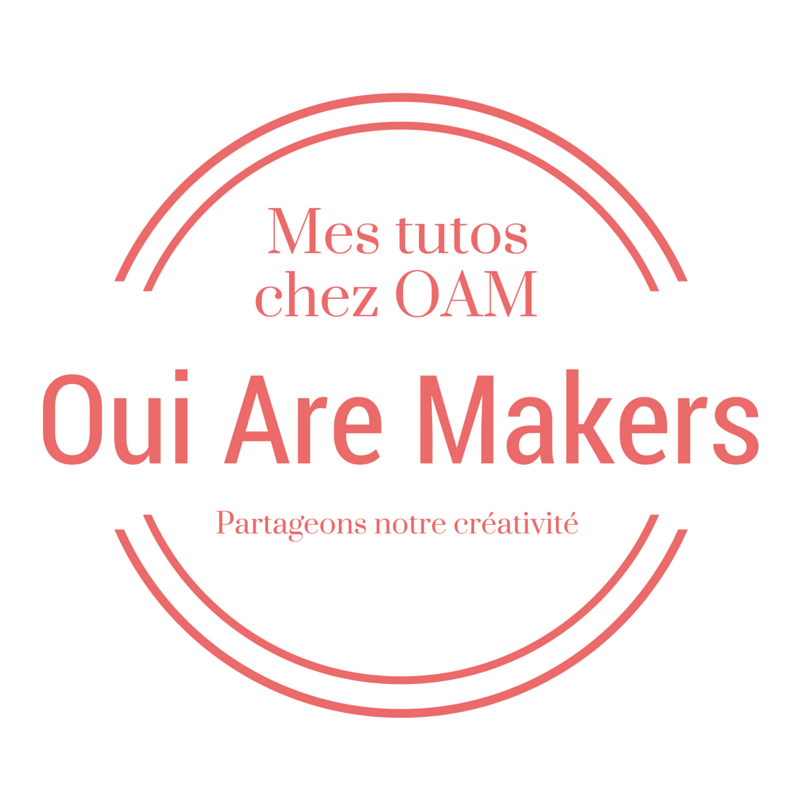 Through a competition with Oui are Makers and Graine Créative, I recently had the challenge of trying to come up with some new ideas for using shrink plastic. 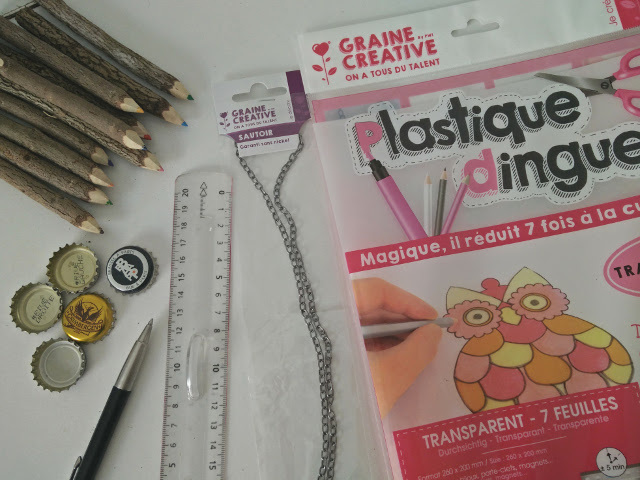 Of course, I wanted to find a project that used recycled materials, so I decided to try to create jewellery using shrink plastic and recycled bottle caps. 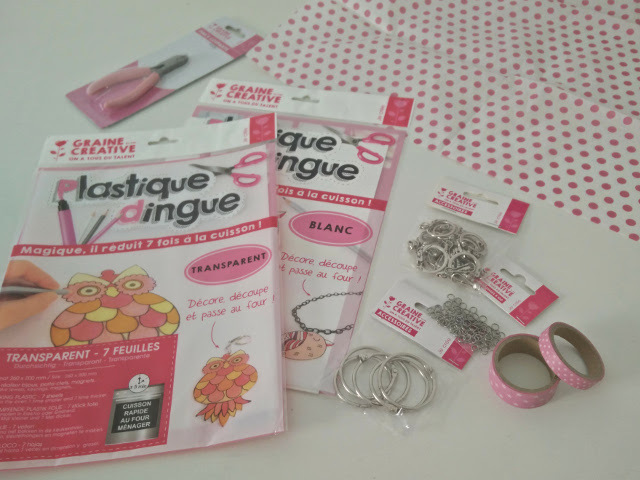 Jewellery fixings : head pins, jump rings, chain, etc. To make your shrink plastic jewellery, you need a circle of shrink plastic that, once shrunk, fits perfectly inside a bottle top. To measure this, you need first to know exactly how much the plastic shrinks when cooked. I made a shrink plastic ruler to do this. 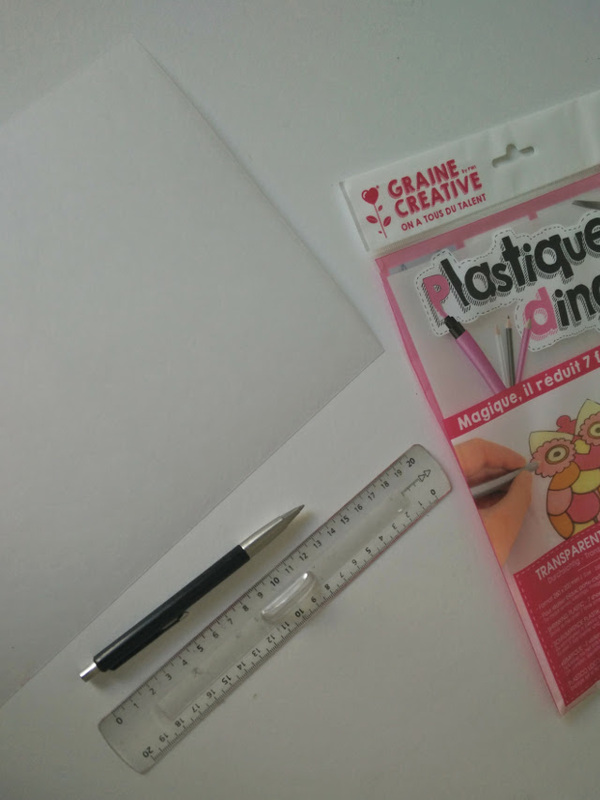 I drew a ruler, to scale, using a pen onto a piece of shrink plastic. 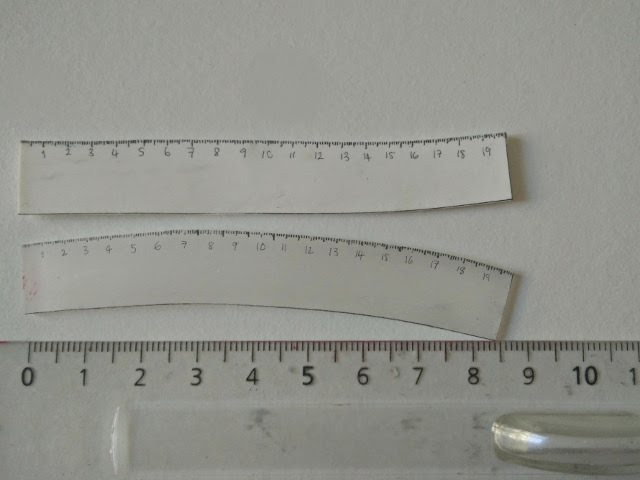 I actually made two rulers from both transparent and white shrink plastic to see if there was any difference between the two. 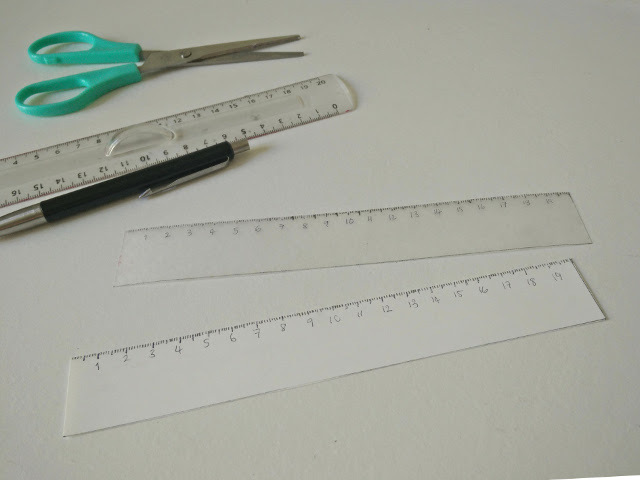 I then cut them out into ruler shapes. 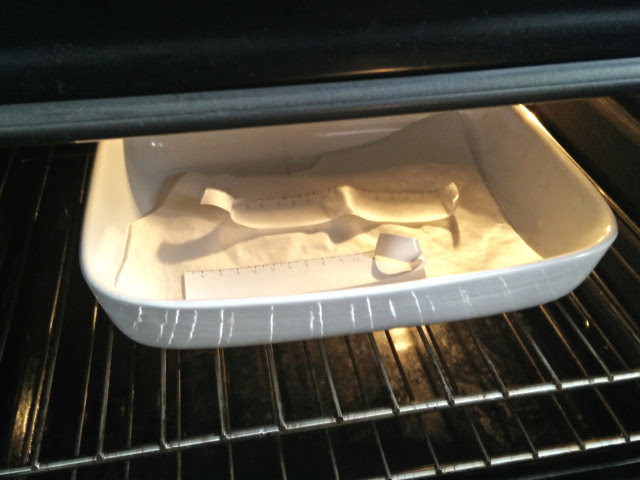 I cooked the shrink plastic rulers in the oven according to the shrink plastic instructions – for a few minutes at 150°. They curl up a lot as they shrink, which can be worrying, but after about 5 minutes they finish shrinking and flatten out. My rulers both shrank the same amount, but were both slightly warped. The transparent one even more so. I’m not sure if this is because of a difference in the two plastics, or just coincidence. 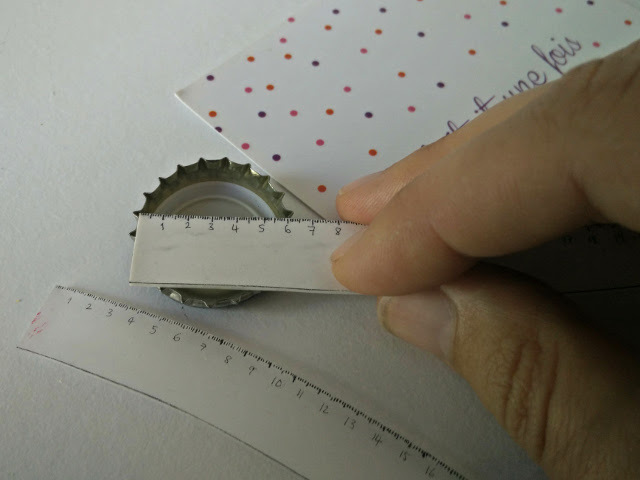 Either way, I was able to measure my bottle top with my shrink plastic ruler. I discovered than I needed a circle of shrink plastic with a diameter of 6cm to fit inside the bottle top. So now I was ready to draw my design. 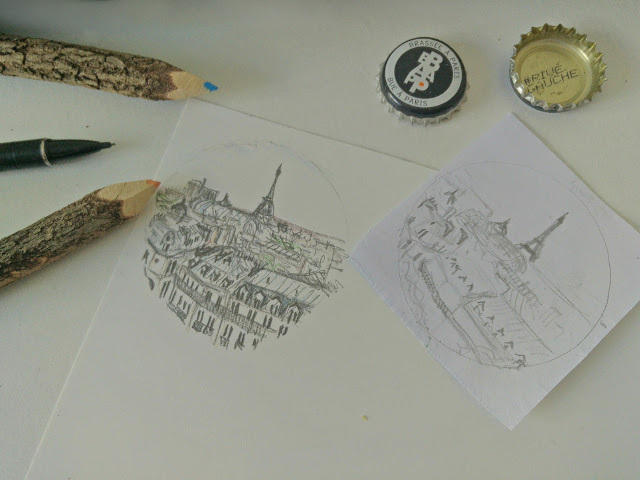 I did a small sketch based on a photo of Paris, but you could use any design you like. You could try a graphic pattern, an illustration or simple drawing. Whatever you choose, you do not necessarily need to draw it freehand. 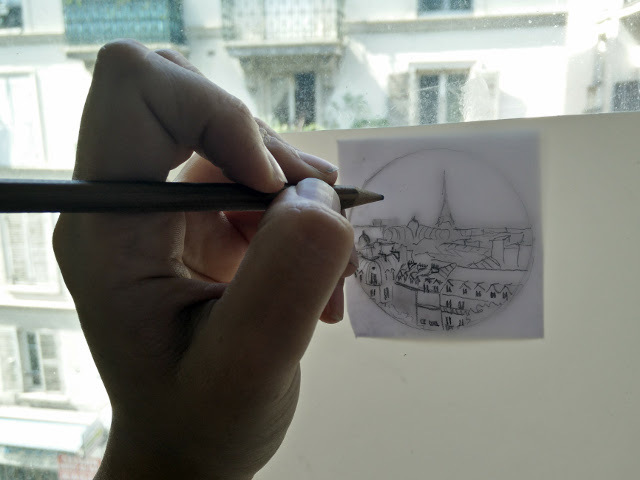 You can easily trace a design by either printing it out and sticking it to a window (so the light shines through and you can see the lines to trace), or tracing over an image on a tablet or telephone screen directly, like a light box. Again, I drew my design on both transparent and white plastic to test the difference. I drew my design with pencil and coloured it in with colouring pencils. I recommend using a hard pencil, and colouring softly, as the colours all become more intense when the plastic shrinks, and if you use heavy pencil lines, your design could end up dark and smudgy. 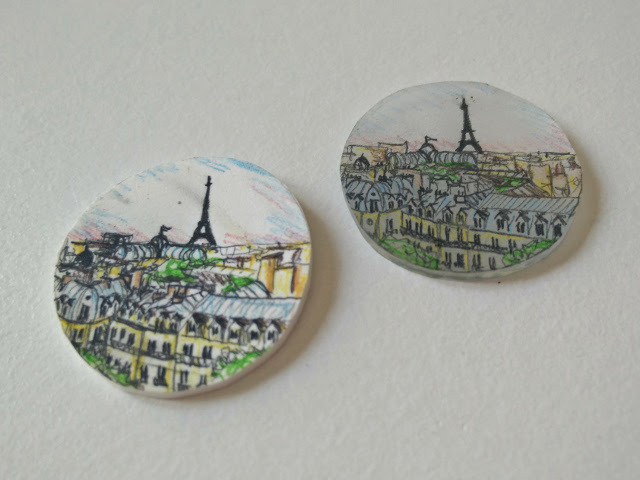 This image is of jewellery made from drawings on transparent (left) and white (middle and right) shrink plastic. The far right drawing was made with a softer, pencil and it looks a lot darker and less attractive. 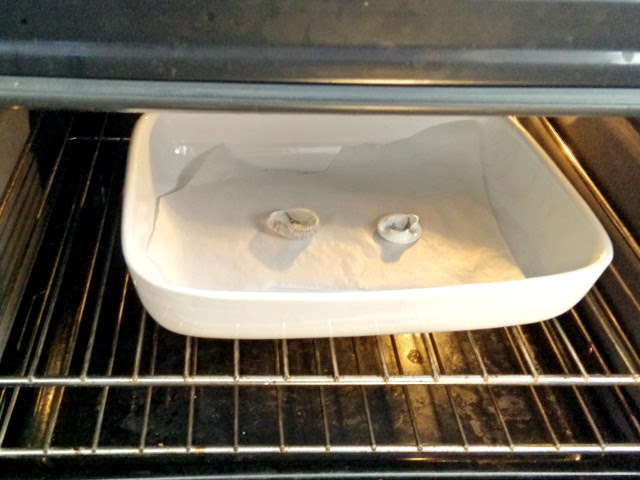 Cook your plastic circles in the oven. Again, follow the instructions, and cook at 150° for a few minutes. When the come out of the oven, make sure they are flat by placing a heavy object on them before they cool. 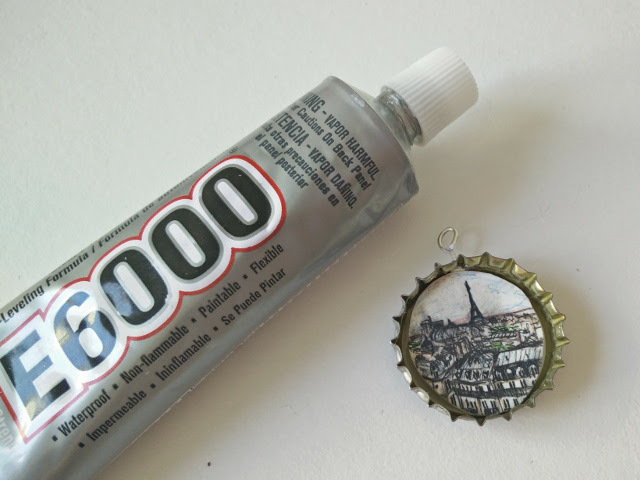 To turn the shrink plastic circle into a piece of jewellery you need to fix the bottle cap to a chain. To do this you need to make a small hole. 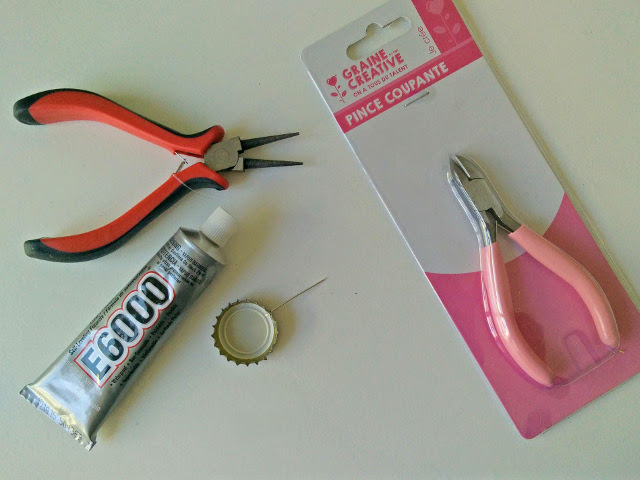 If you want to make something like a brooch or a magnet, you could skip this step and glue a fixture directly to the back of the bottle top. 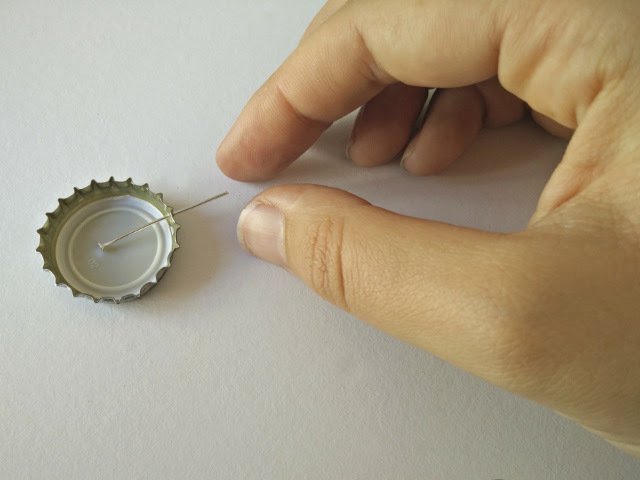 However, I used a small nail and a hammer to make a hole in the edge of the bottle cap, at the top. I then placed a head pin into this hole from the inside, and made a loop. I cut off the excess with wire cutters, and fixed the pin in place with a small dab of glue. Glue your circle of shrink plastic into the bottle top too. 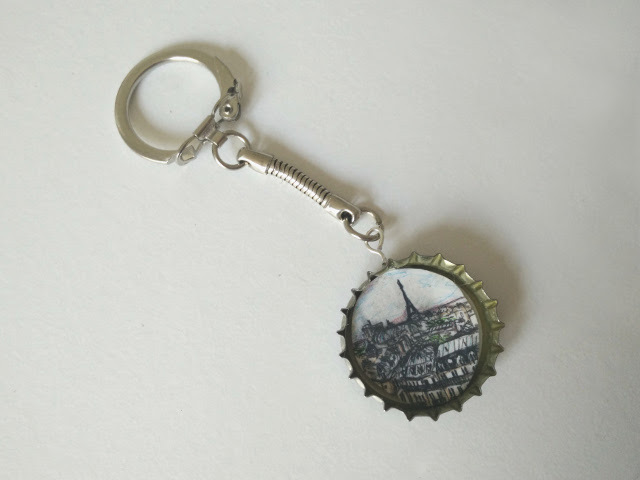 Using pliers, jump rings and jewellery fixtures, you can now turn your bottle tops into jewellery. 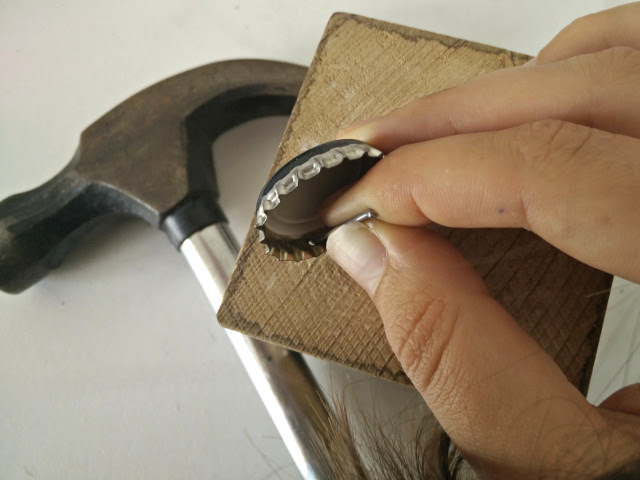 To make a necklace, simply open a jump ring with your pliers, and use it to fix the bottle top, using the loop you created with the head pin, to a necklace chain. You could make other objects too, like earrings or a keyring. 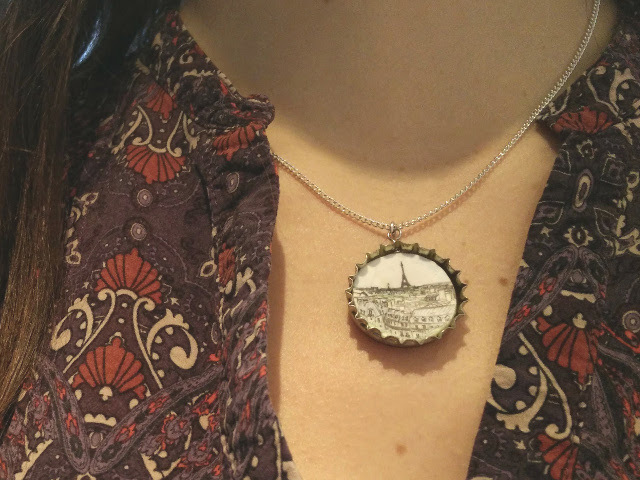 What do you think of this idea for shrink plastic jewellery with recycled bottle tops? What other projects or ideas do you have using shrink plastic? Let me know in the comments!